Following recent events in Zimbabwe, Pastor Dwayne Burks, a former minister to West View, shared what he was thankful for and remembers Marjory Wheatley. Marjory was a long term member of West View Baptist Church, serving in many different capacities both in church, across Hartlepool, and indeed around the world. Dave Niblock and Steve Gambill, joined by Earl McClellan preaching from midday on the Saturday after a frantic dash from the USA to the UK. His transport from London to Bradford didn’t go as planned so Pastor Niblock stepped in to lead the morning session. Important lesson was that we cannot trust someone who is over us if we weren’t able to trust them when they were under us. Don’t let power go to your head as a leader. Don’t work to remove your leaders or undermine them. If God doesn’t want them there he’ll sort it out for you. Valuable lesson for all those who’s work or gifting requires them to lead and offer an example to others. In Ecclesiastes 3 we looked at the seasons, acknowledging that we all have our favourites but that we needed to recognise that all the seasons are necessary and we don’t get to skip them. Importantly we’re not here by accident or chance. You are on purpose, your church is on purpose. The season you find yourself in right now is producing something for your life even if it doesn’t feel like it. Learn to appreciate the ebb and flow of life. Even though we only see what is on the surface, seeds are hidden away underground waiting for their season. Remember none like the word patience, but Paul showed us how to use that in his seasons of shipwreck and imprisonment. 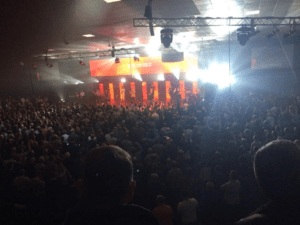 In Jo hn 16:33 we were reminded that we were told we would, not we might, have troubles. Our victory is found always in Jesus. We need to remember that it is always cross, tomb and resurrection, always! 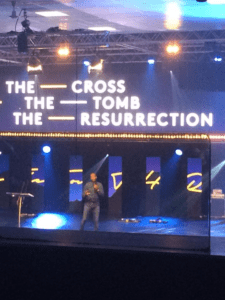 The enemy wants you to believe you will always be in the tomb but that not true. Resurrection is on the way. In Luke 4 we saw the enemy questioning the identity of Jesus and he will try to sow the same seed of doubt in your life. 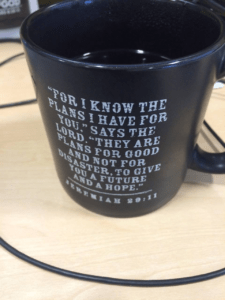 Everywhere Terry turned he was prompted to Jeremiah 29:11 which is the verse he keeps on his desk at work. It was mentioned in 3 separate preaching sessions, and was even on the blackboard of the mock up of a school in the Compassionate Experience. If you get a chance to visit the Experience as it tours around the country, we would recommend it. We also walked through 1 Chronicles, Ephesians 6 and 1 Timothy but we’ll save them for another day. Filling Station has been running since the beginning of April 2016. We are now regularly feeding between 40 and 50 children and adults from the local area and wider across Hartlepool. We have formed new friendships, helped in tough situations, celebrated good news and supported folks through bad patches. Every one of our volunteers who helps out comes away feeling humbled by their experiences and by the life stories of our new friends. Pray for Filling Station to continue and for donors to continue to give in order to keep this project running. 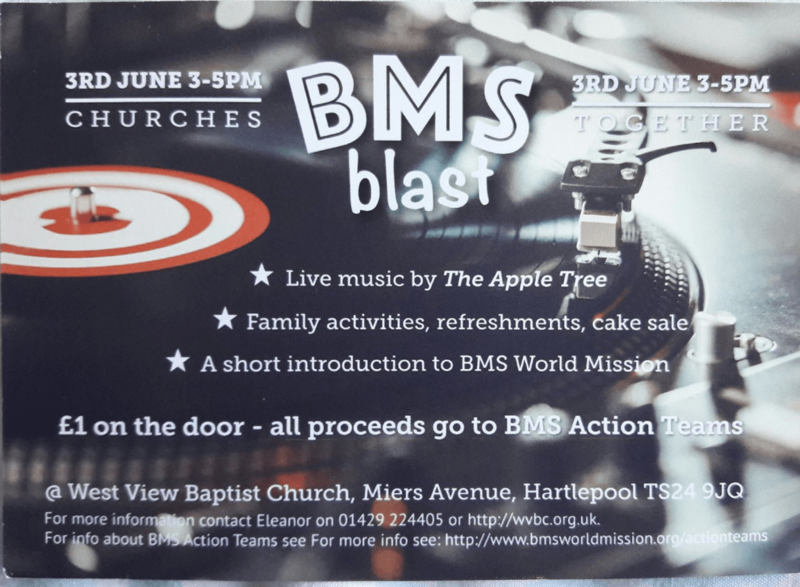 Saturday 3 June is the BMS Blast. It’s a family fun day to raise funds for the BMS Action Teams. There will be food, fun and music by The Apple Tree. On 7th April we started a new weekly event. 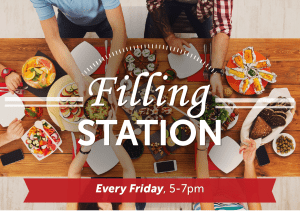 It’s called The Filling Station, and between 5 and 7pm each Friday we serve a free meal to anyone who is hungry! Come with a friend, bring your kids, or come on your own and meet some new friends around the tea table. We also offer a selection of games and activities for young people.